On paper, the Dirt Mile may be the easiest Breeders’ Cup race in recent memory, and I only have about 100 words to say on it. 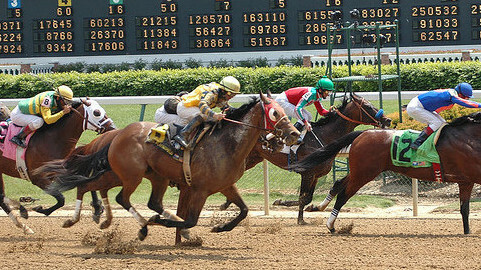 It is defending champion and two-time G1 winner Goldencents against a bunch of G2 or lower horses. This includes 3YO’s Vicar’s in Trouble and Tapiture, who were always a notch below the best this year. I expect Goldencents will be 4/5 or lower, which makes him an automatic play for me in this situation. This is a consequence of the favorite-longshot bias, a topic I discuss here in an article by Ziemba/Thaler. I trust the public when it comes to these sorts of plays. If he’s even money or higher, I’ll go heavier in exactas under Tapiture, and put Goldencents under other low-priced contenders as well (5-1 or lower). Update: Goldencents is 3/5 on the board right now. He may rise to 4/5, but seems a lock to be a win bet here. For much more on the favorite/longshot bias, check out Stealing Money from the Crowd, available here. Image: John Athayde, Copyright 2005.